Can i still use the clutch if i fit any of the clutchless Flatshifter systems? Yes, original use of your clutch is not removed or altered in any way, you can use it as you normally would. Do all Flatshifter products come with parts and labour guarantee? Paddle-shift or manual shift any difference? Concentration! With fewer things to think about it enables you to concentrate more on lines, braking points, etc. which gives quicker lap times. Paddles allow gear changes to be made quickly with less effort. With full throttle clutchless shifts both hands are kept on the wheel, eyes concentrating on the road ahead. I have seen electric gear selector systems offered costing a lot more than your system is there any difference? Yes, they are earning a lot more out of you than we are! Everything in our system is top quality and made to last. Does the Flatshifter Max System change gear faster than manual shifting? Yes. The Flatshifter Max System has been back to back tested against a manual gear change system and recorded a saving of over 1/5 of a second per shift. Just think how many gear shifts per lap you do! Why should i choose electric over pneumatic (Air) systems? Will the Flatshifter System allow me to change gear without using the clutch? Yes, using the Flatshifter Expert system up & downshifting will very fast and clutchless. The Flatshifter Club enables clutchless upshifting only The clutch will only be needed when pulling away and coming to a complete stop. How often should the Flatshifter Max System be serviced? The Flatshifter Max System does not require any maintenance, unlike pneumatic systems, unless it has been used in a particularly hostile environment. Do Flatshifter offer a Factory Fitting Service? No, but all systems are designed for simple D.I.Y fitment or can be fitted by any competent mechanic. We also have various centers who can fit them for you if required. Can I become a distributor for the Flatshifter Systems? Yes. Flatshifter is always happy to discuss possible distributorship agreements with businesses worldwide. Please contact us for further details on +44(0)1206 322557 or Email mail@flatshifter.com. Do Flatshifter offer technical support over the phone or via email ? Yes, both. 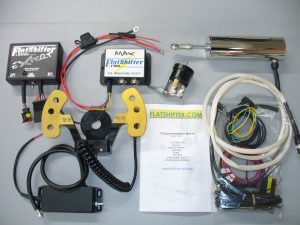 Flatshifter technicians are available to help you on the phone +44(0)1206 322557) and via Email – mail@flatshifter.com, all flat-shifter products come with a comprehensive installation manual. Can I use the Flatshifter Max System in conjunction with my manual gear lever? Yes. With the Flatshifter System installed you can use either the pressure sensitive buttons supplied or the optional steering wheel-mounted paddles to change gear or your standard manual gear lever at any time. Both methods are completely interchangeable at all times. Can I select neutral using the Flatshifter System? Yes. With the Flatshifter System installed you can use either the steering wheel mounted buttons, the optional paddles or your standard manual gear lever to select neutral the buttons /paddles are pressure sensitive enabling a half shift to help select neutral. I have heard that all quick-shifter systems need a lot of setting up to get them adjusted and working correctly, normally a separate test session, is this true? Normally with most systems on the market, yes, but the Flatshifter systems are designed and pre-adjusted to work perfectly straight out of the box 99% of the time, and the other 1% may need a small number of adjustments to get perfect. Can I expect any performance gain by using a Flatshifter clutch-less quick-shifter system? Yes definitely, about 1 metre per up Shift x number of shifts per lap over a 20 lap race will add up to quite an advantage over your competitors, also clutchless downshifting will allow you to brake later by using left foot braking and keeping your vehicle level. The ultimate combination Expert, Max, and paddles. I have seen other quick-shifters for sale but none with your unique downshift auto blip system. How does it work? By operating the gear lever in the downshifting direction, the patented throttle blip system allows a smooth downshift to be made at all speeds without the need for a slipper clutch. The downshift actuator spindle replaces the original engine idle adjuster screw and provides a precise throttle-blip of the correct level to ensure a smooth downshift. ( unloading the pressure on the meshing gears allowing a gear shift) The system has a built-in inhibitor which helps prevent rear wheel locking or engine damage caused by shifting down at too high engine speed. see tech page for full explanation. I have looked at some other clutchless up shift quick shifter type systems costing a lot more money than your system what is the main difference?